We believe that most companies should not outsource sales. That is, the core ‘selling’ aspect of how you build relationships and consult people on your product — it’s your proprietary knowledge and secret sauce. There is no one who knows your customer personas better than you, your product better than you, your brand better than you, and how to handle objections better than you. Doing this sales work effectively is very time-consuming and something’s got to give. This work, after all, is why salespeople are paid! Unfortunately, most sales teams are quick to de-prioritize key top-of-the-funnel workflows in exchange on focusing on the bottom of the funnel. This leads to a dry sales pipeline and money left on the table. This is where ScaleRep comes in — we create engaging conversations with prospects at the top of the sales funnel. ScaleRep automates the “busy work” behind prospecting and outreaching to your ideal customers with the goal of surfacing opportunities for your sales team to focus on. This allows you and your team to double down on your sales processes and high-value accounts. What does working with ScaleRep look like? 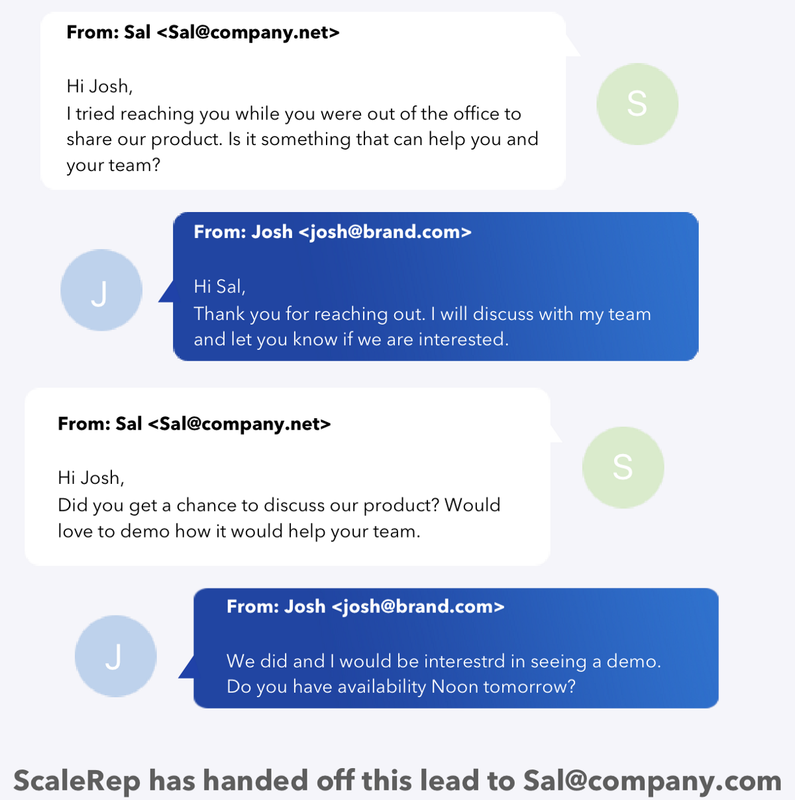 An example of ScaleRep, where we engage with leads as ‘sal@company.net’ and hand off opportunities to Sal, whose email is ‘sal@company.com.’ Sal then begins the selling process. ScaleRep engages with leads on your behalf with the goal of surfacing opportunities. Our AI workflows not only reach out to leads but also capture common replies to further engage them. Once a lead responds positively to an inquiry, ScaleRep hands off that lead to your sales team to pick up and start the selling process. Imagine automatically engaging with thousands of leads every month with no time spent from your team; that’s the power of ScaleRep. Sales reps spend a ton of time finding leads in their target market to engage with. ScaleRep has access to over 320 million leads across the world and can find leads within your target market from a variety of sources to engage with. ScaleRep ingests data from outbound sources, your stale CRM leads that haven’t been touched the last few months, as well as stagnant inbound leads. Users typically engage with anywhere from 2,500 to 20,000 leads a month using ScaleRep. They love having the peace of mind to know that ScaleRep is engaging leads day over day, week over week, while preserving brand appearance and voice, and removing there team from the back-and-forth communications. 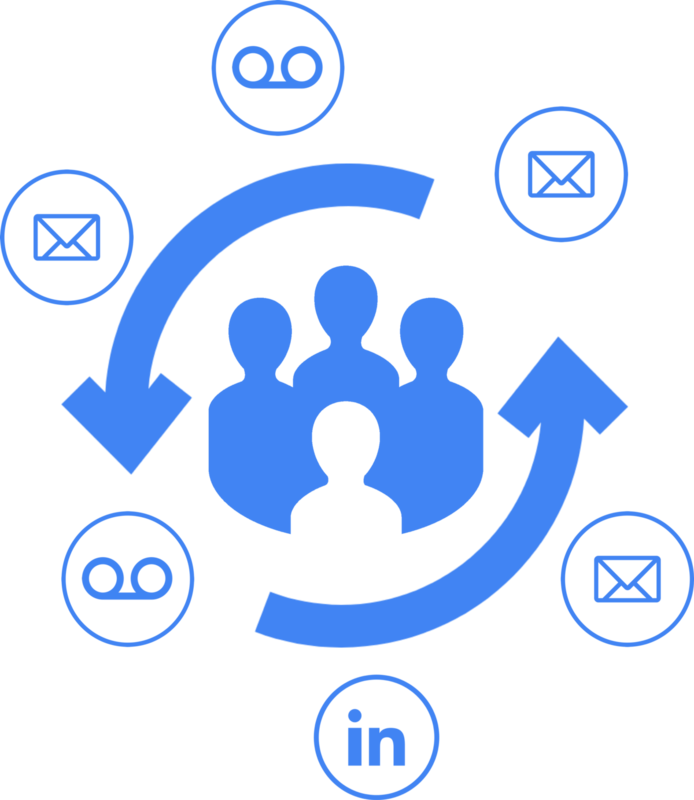 Our goal is to remove talented sales reps and growth teams from the mundane work of prospecting and living in their email or mail merger. Your time and talent should be spent on more lucrative tasks. Therefore, ScaleRep abstracts as much noise as possible from your teams by handling common objections, auto-replies and referrals, and negative emails. All your team sees are interactions from opportunities interested in learning more about your product. While you stay focused on closing deals, we’ll stay focused on surfacing your best leads. Interested in learning more? Feel free to email us at info@scalerep.com, or request a demo today!